"Apocalypse" is a Greek word (apokalypsis) that is not synonymous with "catastrophe" or "destruction." Apocalypse actually means "revealing" (it literally means "uncovering," as in lifting the cover off of something to reveal what is inside). Oftentimes, though, things get revealed as a result of catastrophic or tumultuous events. 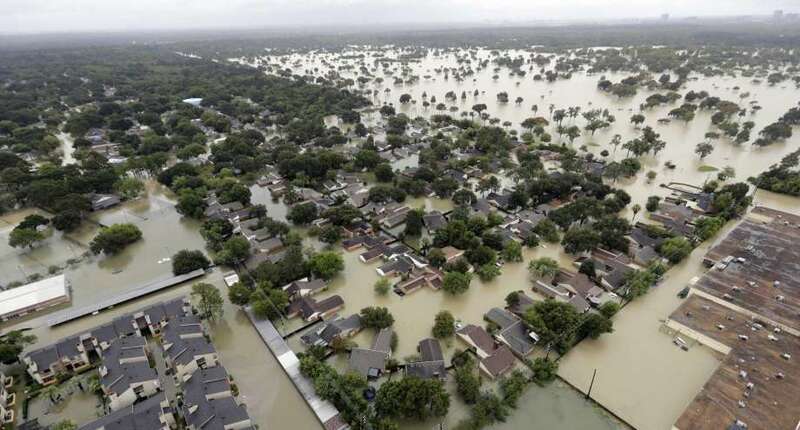 For example, in the wake of Hurricane Harvey's devastating effects upon Houston we saw a revelation of neighbors sacrificially helping neighbors--reenacting in myriad ways Jesus' story of the good Samaritan. Churches and mosques and synagogues and homes and retail businesses opened their doors to shelter people. One of the most inspiring stories I heard was of a business called Gallery Furniture, who invited evacuees to come and stay at their two Houston-area stores (plenty of mattresses, sofas and recliners). As Hurricane Harvey approached Houston, the owner of Gallery Furniture posted a video on the company's website inviting people to come and shelter at the stores. He gave out his personal phone number in case people needed help. Gallery Furniture even sent their delivery trucks out to pick people up and bring them to the stores. Hundreds of people have been sheltering at the stores. Consider the loss of revenue to Gallery Furniture as a result of having stores full of new furniture turned into stores full of used furniture by refugees from the storm. But that's what neighbors do. Contrast Gallery Furniture (and the many similar examples) with Joel Osteen's 16,000 seat Lakewood Church. Rather than pre-emptively preparing and getting the word out that the church could be used as a shelter, Lakewood Church appears to have kept its doors closed and only grudgingly opening to shelter its neighbors after being shamed on social media. Initially the church claimed that they remained closed because their building had experienced "severe flooding" but now Osteen admits that "we were blessed to not have flooding here." The apocalypse in this case is that it was a furniture salesman, not a popular preacher, who demonstrated Christianity. Another apocalypse came this week in the form of the "Nashville Statement," a just-released document signed by over 150 evangelical leaders (including John Piper, Francis Chan, Wayne Grudem and John MacArthur) which denounces LGBTQ people and those who support LGBTQ people. It is revealing that what motivated these leaders to come together and make a public statement was not the violent racism that manifested in Charlottesville or the threats of cataclysmic war of late or the corruption at the highest level of our government that is becoming increasingly evident. No, their rallying point was to "affirm" that gay and transgender people should not be afforded the same dignity and rights as everyone else. In the Gospel of Matthew, Chapter 7, Jesus warns that "Not everyone who says to me, ‘Lord, Lord,’ will enter the kingdom of heaven, but only the one who does the will of my Father in heaven. On that day many will say to me, ‘Lord, Lord, did we not prophesy in your name, and cast out demons in your name, and do many deeds of power in your name?’ Then I will declare to them, ‘I never knew you; go away from me, you evildoers.’" What is the "will of the Father" that Jesus referred to? Elsewhere in the Gospels (and throughout the Christian and Hebrew scriptures) it is made quite clear what God would have us do: care for the poor, feed the hungry, shelter those in need of shelter, welcome the stranger, speak up for the oppressed and speak out against injustice, make peace, practice humility and mercy and kindness and fairness, etc. The apocalypse in Jesus' time was that so many religious leaders completely missed the point. The apocalypse today is that they still do. 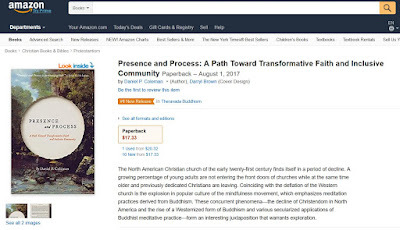 My book, Presence and Process: A Path Toward Transformative Faith and Inclusive Community, is featured in an article that appeared today in Publishers Weekly (the international trade magazine for publishers and booksellers). "Today we see in every religion an inherent danger whereby the faithful are allowed to settle for the trappings...instead of continuing to grow through an intensive searching in one's heart for the wild God of the desert who cannot be put into convenient boxes of concepts and doctrines. 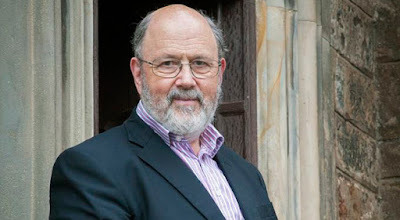 Western theology by and large has become reduced to a static form of objectifying God's transcendence." "War against an external foe is a most excellent means of distracting the populace from grievances at home." 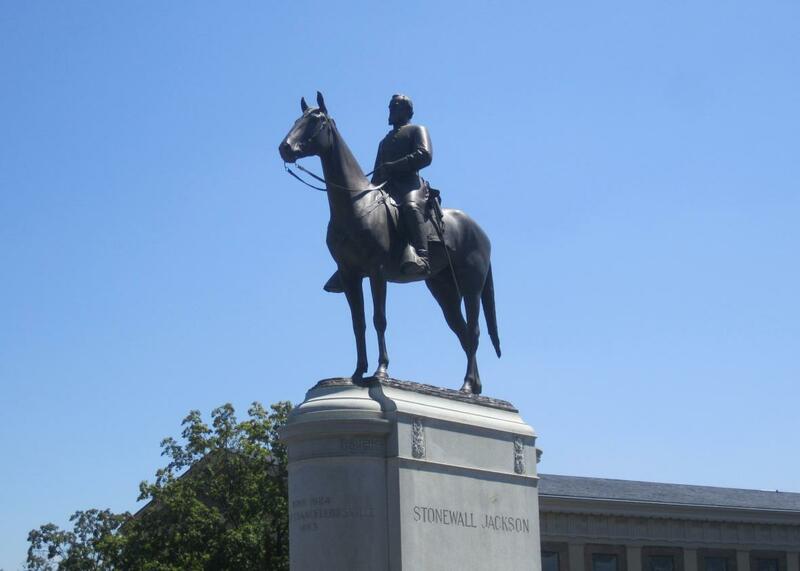 One of the silliest arguments I've heard against removing Confederate statues is that doing so is an attempt to "erase" or "rewrite" history. As if statues and monuments are accurate depictions of history. There is an old saying, often attributed to Winston Churchill, that "history is written by the victors"--in other words, by those in power. I think this is especially true when history is written in the form of statues and monuments. Statues and monuments, by their very nature, tend to elevate and aggrandize their subject. Fortunately, if one is honestly interested in learning history, there are these amazing things called "books" which can enable one to study history in detail and from multiple perspectives. Of course, those Confederate statues were erected decades after the Civil War--often in the Jim Crow era from 1900 to 1920 (and also in the Civil Rights era of the 1950's through 1960's) by folks who wanted to make a statement. They lost the Civil War but retained their position of civic power and clung to the ideology behind the Civil War. Another axiom about "history" is that history is not what actually transpired but rather the stories we tell about what transpired. Each of those stories is always told from a particular perspective because humans are subjective creatures. The perspective of history told by Confederate statues and monuments is narrow and hagiographical and entrenched in racist ideology. The beautiful thing about books on history is that one can read several accounts representing different perspectives and then make up one's own mind. So lets remove the statues and promote reading instead. 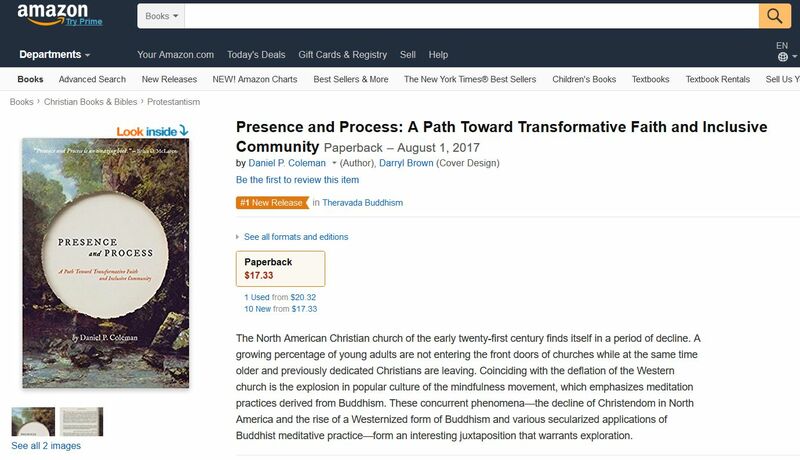 Amazon is showing Presence and Process as the #1 New Release in the category of Theravada Buddhism. "While some long for fruitful dialogue between Christianity and Buddhism, Daniel is bringing in the first fruits of the harvest! In Presence and Process you get a clear and insightful invitation to a place where the boundaries we have inherited between the East and West, contemplation and justice, and theory and practice are dissolved. I loved so much of this book, but can't wait for church leaders to take the ecclesiological vision to heart." I've been thinking lately about the Gulf of Tonkin incident, which was used as justification for the U.S. to enter fully into the Vietnam war. According to the U.S. 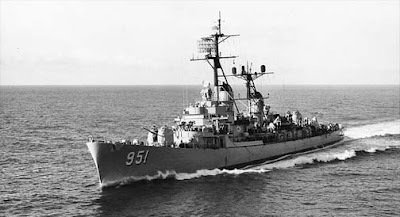 Naval Institute, "The administration's zeal for aggressive action, motivated by President Johnson's election worries, created an atmosphere of recklessness and overenthusiasm in which it became easy to draw conclusions based on scanty evidence and to overlook normally prudent precautionary measures. Without the full picture, Congress could not offer the checks and balances it was designed to provide. Subsequently, the White House carried the nation into the longest and one of the most costly conflicts in our nation's history." As a song from that era says, "When will they ever learn..."
I was a kid when the CB radio fad hit. There was that song, Convoy, and then the movie based on the song and next thing I knew my dad was installing whip antennas on the station wagon and mounting a CB radio under the dash as we were about to leave on our family summer vacation. I remember the thrill--as we drove across the plains of Colorado--of pressing the button on the microphone and saying "Breaker, breaker 1-9" and hearing a husky ethereal voice reply "Come on back, breaker." It was fun. We learned the lingo and etiquette ("What's your 20, good buddy?"). It broke up the monotony of those long drives to Disneyland and Las Vegas and the Grand Canyon and far-flung relatives. It was helpful to have a CB radio on the interstate back in those pre-Internet, pre-cellphone days. It probably also drove the serious CB users--the long-haul truckers--up the wall having all of us amateurs clogging the airwaves trying to sound like C.W. McCall. We look back on it now with fondness and perhaps a little bit of embarrassment. Is that how we'll think about Mindfulness in twenty or thirty years? 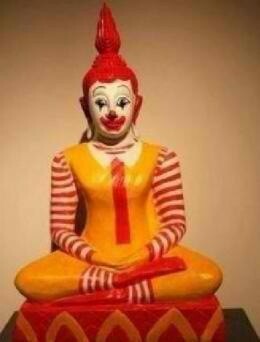 I've heard "serious" practitioners of Buddhism speak disparagingly of "McMindfulness." Earlier this week Jimmy Fallon on the Tonight Show had guest Andy Puddicombe lead the audience through a two-minute meditation; probably the longest stretch of dead-air in the show's history. Newsweek and Time have published big glossy special issues about Mindfulness (both of which, of course, featured cover photos of attractive young women in blissful meditative states). There are now dating services, such as dharmamatch.com, geared toward helping Mindfulness practitioners find mates. A plethora of manufacturers and retail outlets make and sell meditation supplies, from altars to zafus. New Mindfulness apps for our smartphones keep popping up. 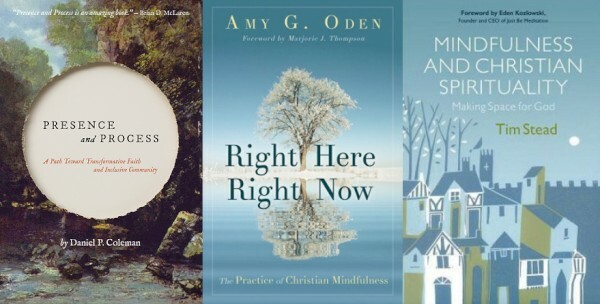 Mindfulness teachers and books and retreats and workshops and TED talks continue to proliferate. Although I think we will indeed look back in embarrassment on some of the excesses of the marketing of Mindfulness, I don't think Mindfulness itself is a fad. Because Mindfulness is rooted in a 2,500 year old Buddhist tradition (and is unlikely to be replaced by newer "technology"), and because it has such a proven track-record of being genuinely beneficial, it is here to stay. But like the fake Buddhist monks who aggressively panhandle tourists in New York City and San Francisco, there will always be a need to discern what is bona fide from what is disingenuous and crass. The explosion of Mindfulness into popular culture is part of a longer, steadier trend of Buddhism making inroads into the West. That longer trend can be traced back in part to Zen monk Shoyen Shaku's appearance at the 1893 World Parliament of Religions in Chicago, and then his disciple D.T. Suzuki's tireless efforts to promote Buddhism outside of Japan (including dialogues with appreciative Christian monks such as Thomas Merton) into the 1960's, and then the charismatic Tibetan master Chögyam Trungpa's establishment of Buddhist meditation and education centers in the U.S. and Europe (including the Naropa Institute, now Naropa University, in Boulder, Colorado) in the 1970's, and the rise in popularity of the effervescent Dalia Lama, and then the importation of Theravada-based vipasanna (aka insight or mindfulness) meditation to America by Jack Kornfield, Joseph Goldstein and Sharon Salzberg. The various strains of Buddhism--Zen, Tibetan, Theravada, Pure Land, etc.--long separated from one another by culture and distance, are now mingling in the West at an unprecedented level. Many observers postulate that an entirely new strain of Western Buddhism is emerging as a result. And, like most things Western, it will no doubt be susceptible to commodification and hyperbole. The facade of Mindfulness in America may be bright and neon-lit but the temple behind it is majestic and the door is open to enter and explore further. Mindfulness isn't going to flame out or jump the shark. It may eventually be taken for granted as it becomes a standard component in school curricula and workplace wellness programs and patient rehab protocols and TV-show dialogue and people's morning routine. Maybe we'll stop calling it Mindfulness but I suspect that twenty or thirty years from now a lot more people, Buddhists and non-Buddhists, will be practicing Buddhist-derived meditation than are now--but it won't be particularly exciting or exotic or newsworthy. It will just be part of the Western cultural landscape, like the imported Himalayan blackberry bushes that have spread throughout the Pacific Northwest where I live. Speaking of which, this is my exit. So remember: keep the shiny side up and the greasy side down. Try not to feed the bears. 10-4, good buddy. See you on the flipside. Over and out. Namaste. Excerpt: "Many Christians are finding mindfulness practice to be not just compatible but complimentary to their faith. They discover within these Buddhist-derived practices not only a key to transformation and renewal and holy living but also a doorway to a neglected Christian tradition. All truth is God’s truth, and so it should not be surprising that various cultures discovered the benefits of meditative and contemplative practices and then couched them within their own religious systems." "After a long and gradual arc of creeping disillusionment with the form of evangelical church I was experiencing, and having listened to thousands of sermons, engaged in countless Bible studies and attended dozens of “life-changing” seminars, I came to a point of asking 'Is this it? Is this all there is?' I was profoundly dissatisfied with the lack of spiritual depth and maturity I saw in myself and in my church peers, including our leaders. Consuming Bible lessons, singing heart-felt worship choruses and scrupulously engaging in personal sin management had brought only a modicum of spiritual maturity into our lives. I, and the other Christians I knew, continued to struggle with petty anger and jealousy and lust and fear and prejudice and dishonesty and selfishness and impatience and a subtly pervasive cynicism derived from living in what we had been taught is a fallen world. We looked to the future for a great coming revival—always just beyond the horizon—which would make everything right. This impending movement of dramatic Divine intervention—continually preached by our pastors, promised by our prophets, and prayed for by us pew-sitters—never came. I gradually became convinced that there had to be something more, something that was transformative not as a grand future event but right here and right now amid the mundanities of everyday life. But I had no idea what that transformative something might be." 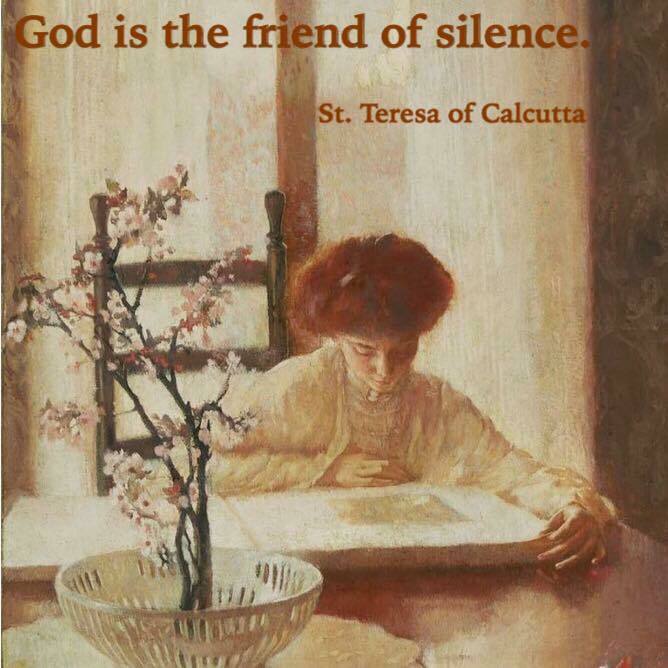 "Stillness is the greatest revelation." Today is the day that 'Presence and Process' begins shipping from Amazon. Yay! 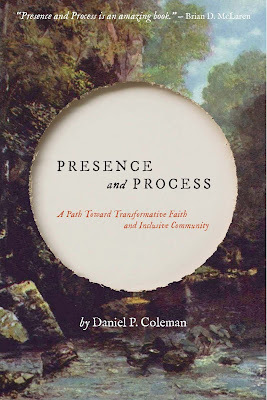 "In Presence and Process, Daniel Coleman has created a unique and useful synthesis--showing how a convergence of perennialism, process theology and mysticism (Christian, Buddhist and Quaker) could have a profound role in fostering spiritual formation in this postmodern, post-Christendom age. This is a pioneering work of practical theology."